Taste test: The potato chips were thin cut, but they were still fairly crunch with a good crispmess. There was a nice potato taste, a fairly low level of salt, and amedium level of greasiness. 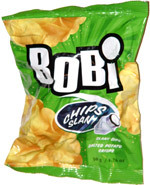 Bobi was quite generous, packing a whole lot of chips into this fairly small bag. Smell test: Pretty good potatoey smell. 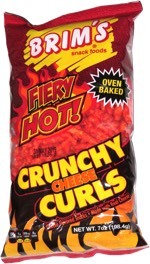 This snack was discovered by Amitai in Croatia. Review published .